Sung Hwan Cho, Joseph. Worship Message for the Church Choir. Yesol Press, 2010. Dr. Cho started his music education by joining the World Vision Children's Choir at age 9. He traveled with the choir to many countries as a boy soprano. While traveling in the choir, he also appeared on the CBS show, "One to One" with Julie Andrews. He has served as a Music Director for several choirs, including the Fareast Broadcasting Chorale and the Grace Chorale. He has performed many major choral repertoires including Resurrection Symphony by Mahler, Messiah by Handel, St. Cecilia Mass by Gounod, 9th Symphony and Jesus on the Mt. of Olives by Beethoven, Coronation Mass, Vesperae Solennes de Confessore, and Requiem by Mozart, among many others. As a vocalist, Dr. Cho has performed in numerous concerts. He was invited to join the L.A. Philharmonic in their neighborhood concert and to be a soloist for the Angeles Chorale in their presentation of Haydn's Creation under maestro Don Neuen. 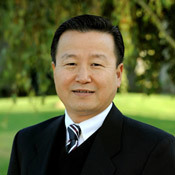 He also serves as Music Director at Sa-Rang Community Church which is the largest Korean American church in the States. He is also the Musical Director for the Aioneo Christian orchestra, which consists of professional Christian musicians around the Orange County area. I enjoy meeting people of different backgrounds. Romans 12:1&2 Therefore I urge you, brethren, by the mercies of God, to present your bodies a living and holy sacrifice, acceptable to God, which is your spiritual service of worship. And do not be conformed to this world, but be transformed by the renewing of your mind, so that you may prove what the will of God is, that which is good and acceptable and perfect.